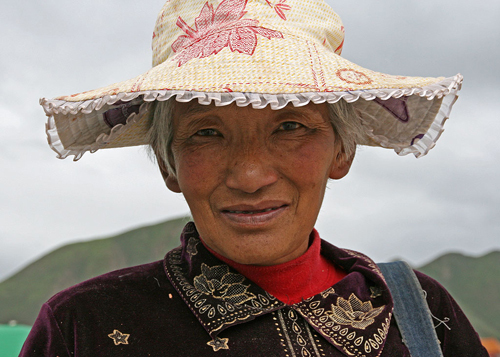 Yushu’s remoteness also has its advantages: for instance, currently Yushu’s population is still roughly 97% Tibetan, which is quite a miracle when compared to many towns in Tibet proper, where recent Chinese immigrants have formed sizable communities. I must admit that when I first caught sight of the town from the coach window, my heart did somewhat sink. The outskirts are pretty scruffy and the bus station is a ramshackle, run down affair. As I alighted from the bus and struggled to catch my breath – after all, Yushu is situated at a staggering 3680 meters above sea level _ I asked myself if we had made a wise decision by coming here. It only took a few minutes however, to realise we were somewhere special. 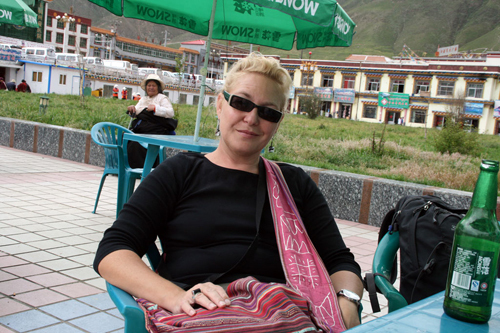 As Margie went in search of a hotel, I sat down with our bags on a step opposite the huge square with the giant statue of King Gesar of Ling, a Tibetan warrior-god, and began to take in the amazing people around me: not since we hit upon a huge festival in Kanding many years ago had I seen so many Khampas dressed in their finest, strutting around proudly, showing off their jewellery, hair do’s and best clothes. 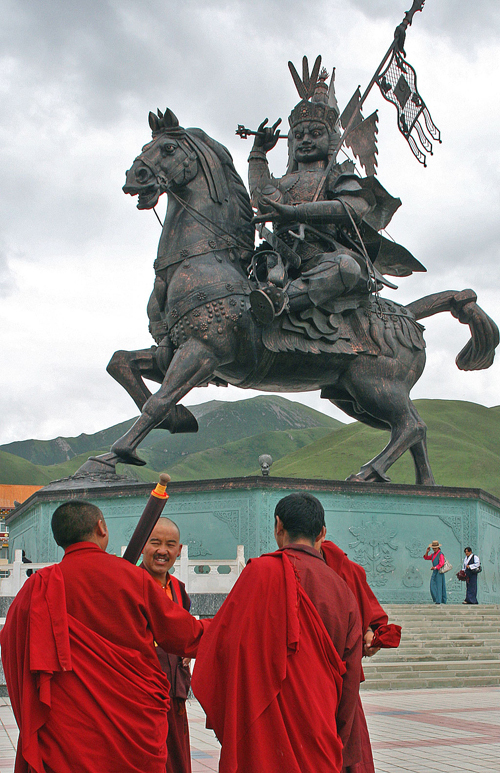 The central square under the gaze of King Gesar was to become our Mecca during our stay in Yushu. The Statue is enormous, though quite kitsch and pretty shoddily made. However, it is so big that you can’t help finding yourself drawn to it as to a magnet. Behind the statue, wild mountains form a dramatic backdrop. Fast moving clouds frequently blot out the bright sun, provoking radical and continuous changes of light that transform the shades of colour on the mountain slopes from a gentle alpine green to a menacing forlorn grey in a matter of seconds, accompanied by the corresponding and equally frequent changes in temperature. This same light bounces on and off King Gesar, making it impossible to keep your eyes off him. Obviously, the attraction of the square isn’t all about the statue, or even the light: the square boasts one of the greatest blessings in this often inhospitable part of the world: a whole series of terraces where you can sip tea, have a soft drink, or enjoy a decent, cold beer! 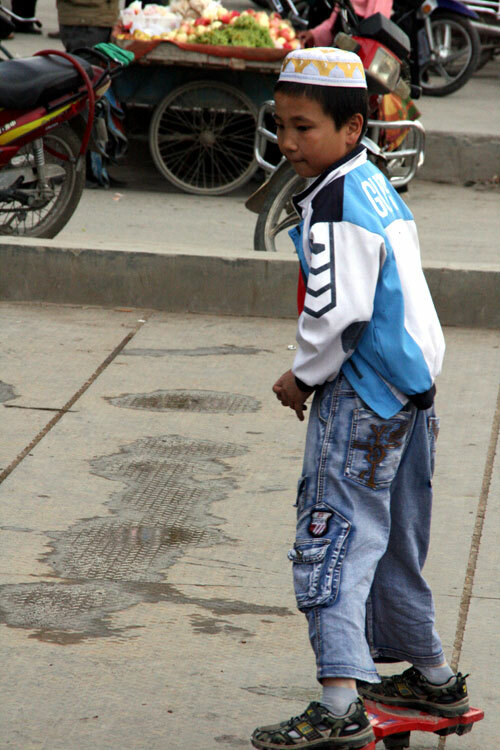 It is hard to think of a better way to blend in and watch devout pilgrims circumambulating King Gesar’s statue, local families coming out for an afternoon stroll, or trendy Yushu teenagers showing off on their skateboards. Don’t expect to be left in peace though: curious nomads from even remoter areas will come up and gape, laugh unashamedly, and point at you, as if it were you, and not them, that looked like something from another century. 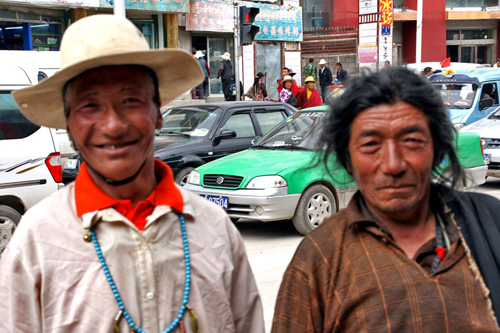 Yushu locals will ask to have their photos taken with you. And then the beggars; ah! The beggars! They start pestering you the moment you sit down and don’t stop until you leave. You might mistakenly believe that the whole town dedicates itself to the profession. However, by the second or third day you will realize that they’re the same 20 or 30; they just do the rounds several times every afternoon. The (fake??) 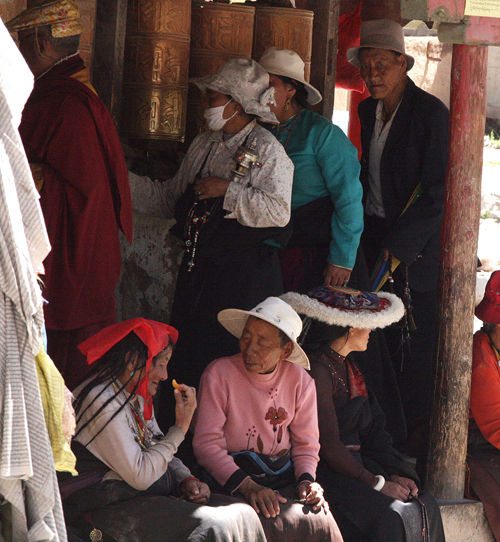 monks asking for alms and donations are the most persistent, but even they tend to give up on you after about two days. 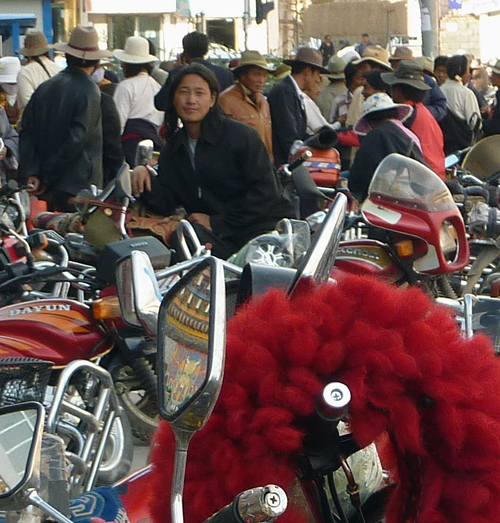 Don’t get too worked up about this Yushu custom; after all, you can always do as the locals do: collect a whole wad of small-denomination banknotes (one Mao will do = one cent Euro) and just hand them out. And remember, despite the beggars, the square is still one of the most relaxing places you’ll find in these parts of China. 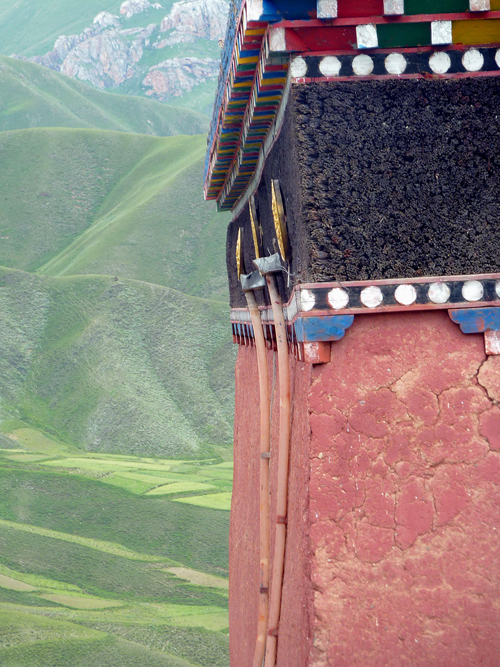 There isn’t that much to see in Yushu; the big Jyekundo Dondrubling Monastery (Jiegu Si) that crowns the hill overlooking the town is often closed; its locked-up halls and chapels guarded by a ferocious pack of wild dogs. Locals advised us to go early in the morning if we wanted to get in. However, the views over the town and surrounding countryside make the visit worthwhile, whether the monastery is open or not. In town there are a few Chörtens to walk round and some interesting, traditional Tibetan mud-brick neighbourhoods to wander around. 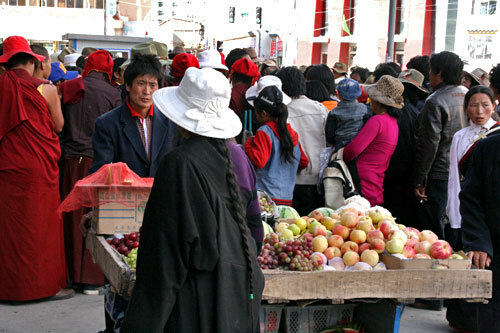 Probably, the most enjoyable thing to do is just to stroll up and down the main street, where the Tibetan stores buzz from dawn to dusk with Khampas and pilgrims from all over Amdo and even further afield. For the moment there’s no tourist bric-a-brac on sale. 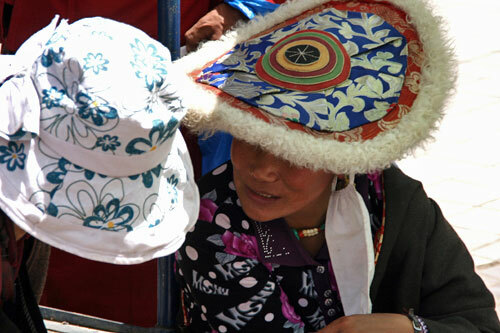 It’s all Tibetan food and household staples, useful for grassland living, mixed with religious and decorative articles. 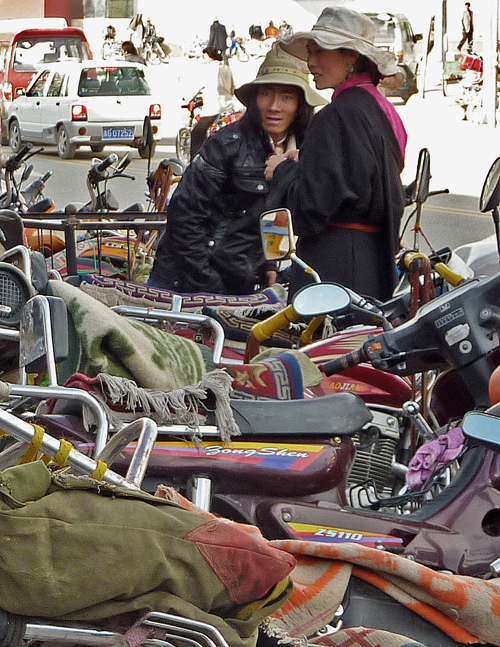 Shops selling plastic buckets, colourful rugs, heavy knives and daggers, prayer beads, flags and wheels, shiny brocade dresses, multicoloured aprons and heavy coats all vie to get the discerning customer’s attention. 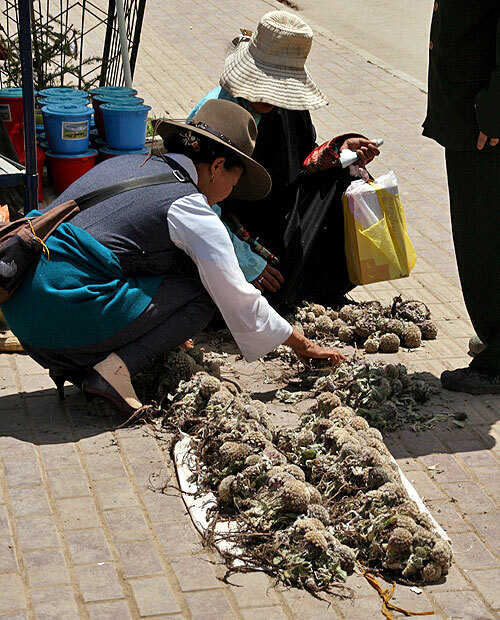 On the streets, Tibetan women sell a strange looking fungus, called Yartse Gompa, which is highly sought after for its medicinal properties. Though apparently there is something of a crisis in the fungus industry and prices have fallen dramatically. One thing that is not in crisis is the market for Tibetan mastiffs, as the many signs announcing shops and breeders indicate. 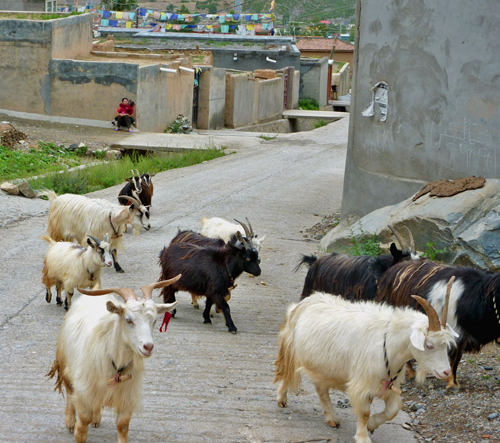 And while the mangy versions prowl the back streets of Yushu, looking for the juicy calves of any unaware foreigner, their more groomed and manicured brothers fetch astronomical prices from China’s nouveaux riches (baofahu暴发户). 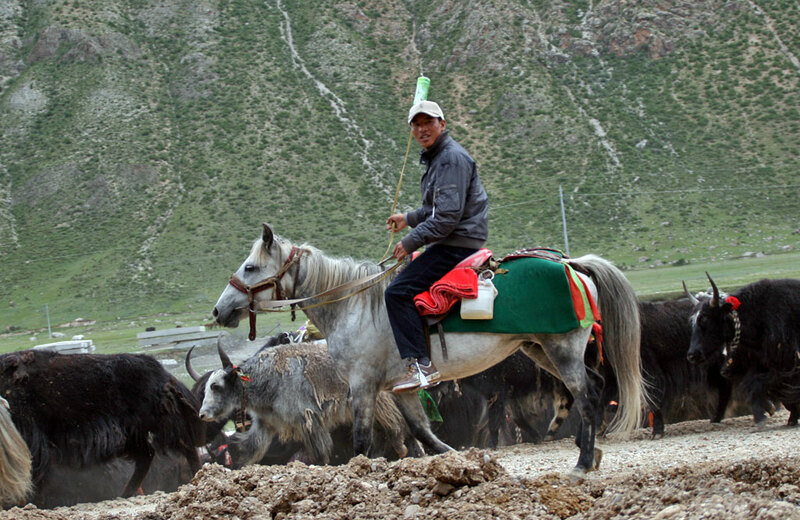 Up until recently, Yushu’s main tourist pull was its horse racing festival, held in late July. 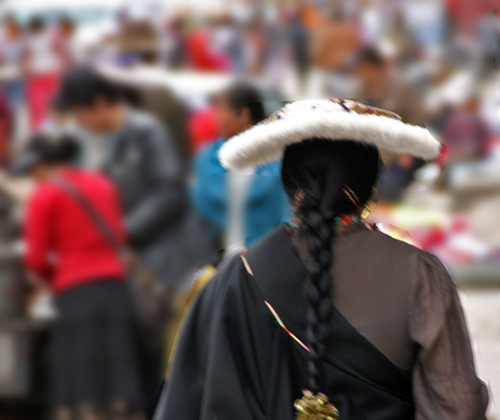 Unfortunately, the festival has been cancelled in recent years, as the Chinese authorities fear the gathering of thousands of Tibetans for a few days of drinking and merry- making as a potential security nightmare. For how long this ban will last is anyone’s guess. 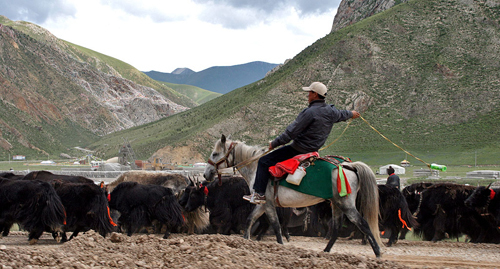 After what I have said above you might be wondering if it’s worth the effort to get to Yushu. Don’t think twice! 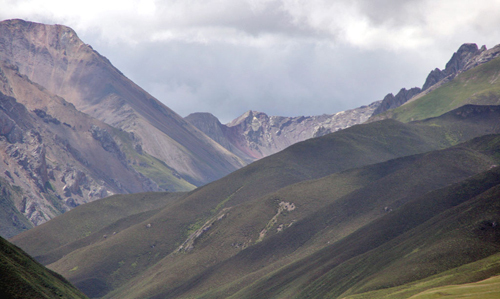 Most of all, Yushu makes a great base from which to branch out and explore this wild and as yet unspoilt region. Hidden valleys, remote and spectacular temples, amazing hiking opportunities abound, and the people are friendly and welcoming. Moreover, you might be advised to get there sooner rather than later, as the newly opened airport will no doubt bring radical changes. Already, the fairly frequent, scheduled flights from Xining have reduced the travelling time from the gruelling 18 hours by bus to a painless, less than two hour journey by plane. In Xining city, travellers’ hostels and travel agents are springing up, offering tours to the region. The local authorities are promoting the area as the source of China’s three great rivers: the Yangzi, Mekong and Yellow Rivers, all of which are found nearby. For the time being, you may still be the only foreign face in the crowd. 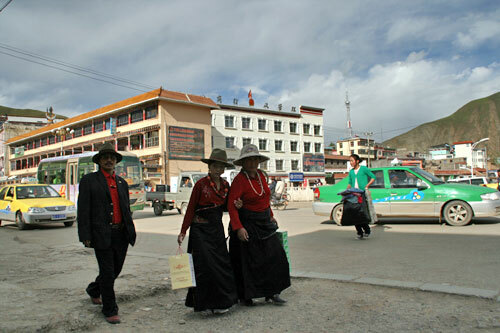 We first stayed in the relatively new Yushu Binguan. 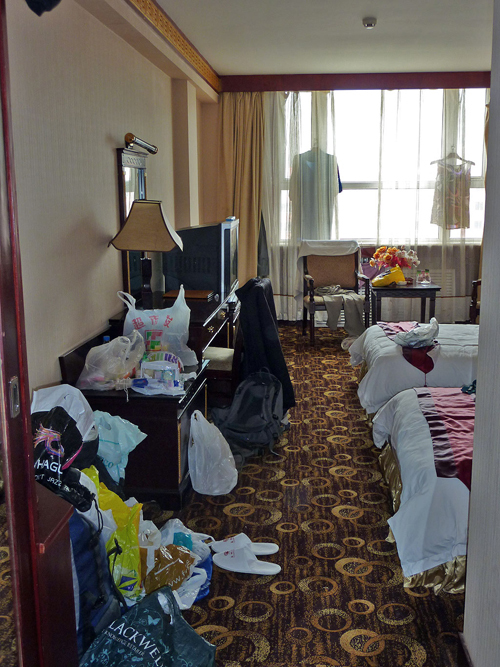 It was relatively clean and relatively overpriced: 300 yuan for a double. Staff attitudes were mixed, though a nice, English speaking Tibetan lad, fresh back from India, was very helpful. 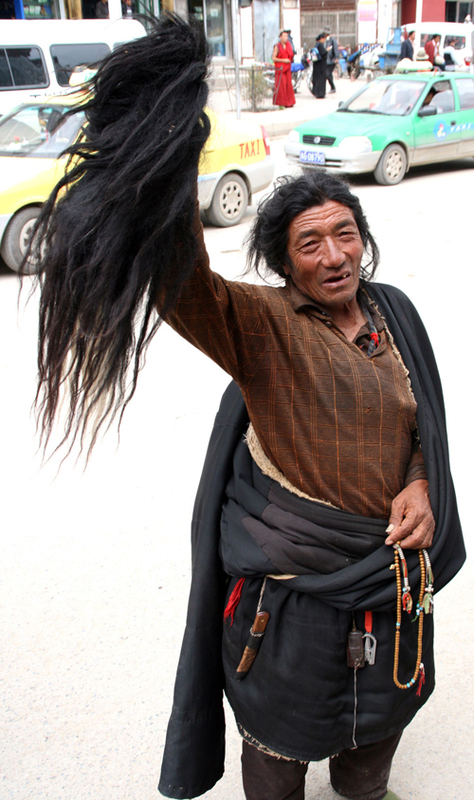 The Yushu Binguan is the entertainment center for the local Yushu elite, Tibetans and Chinese alike. We witnessed the departing ceremony for the paramilitary police held in the hotel’s ballroom. 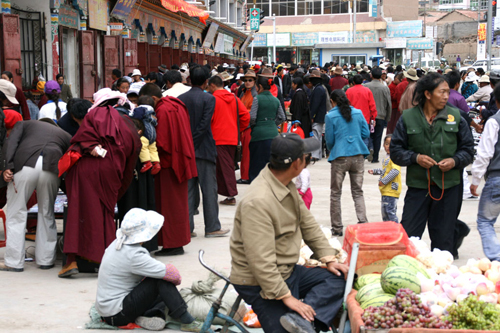 The police had been sent to Yushu to keep an eye on things when trouble broke out in Lhasa. It was somewhat of an oxymoron to see local Tibetan leaders garlanding and thanking the very people sent to oppress them. The police finished the party off with a typical martial arts display of how they would deal with any would be protestors. Bizarre! Thinking that the Yushu Binguan was not worth the money, we moved into the cheaper Qi Xiang Binguan opposite the main square. While the rooms were big and light and staff friendly, the carpets were virtual ashtrays and impregnated with the smell of stale smoke that could not be removed. The bathroom plumbing also left a lot to be desired. Other options we checked out were worse. New hotels are going up and may be open when you arrive. Tibetan food can be had at the night market, on the corner of Shengli Lu and Minzhu Lu, it’s basically for carnivores only: grisly meats are broiled and grilled from dusk until well into the night. Other Tibetan restaurants abound near by. There are a few good Sichuan restaurants down a side street near the Yushu Binguan. Huge bowls (enough of 4 people) of spicy fish are the specialities (Shuizhuyu水煮鱼). Along Shengli Lu there are some decent Muslim noodle and dumpling restaurants. We arrived in Yushu from Xining on the overnight bus (18.00). It took 16 hours. It’s a long, uncomfortable journey. The bus is actually okay, but the non-stop smoking and fast climb to high altitude make it pretty unpleasant. From Yushu we went to Manigango. 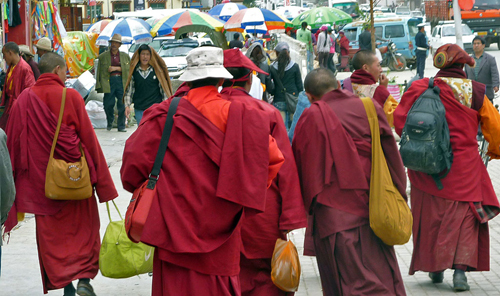 There are daily buses From Yushu to Serxu (Serxu new town, not the monastery). You’ll probably need to stay the night in Serxu and then catch buses to Manigango, Ganzi, Kanding or Chengdu the following day. 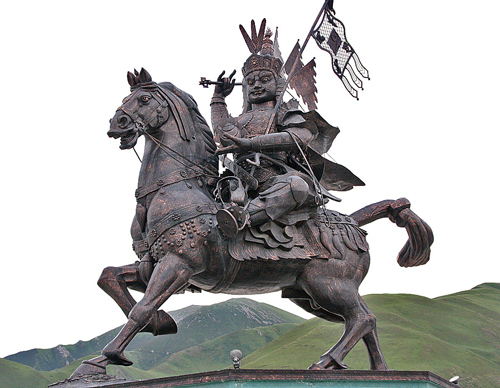 There is also a direct busfrom Yushu to Chengdu. Due to serious altitude sickness problems we decided to hire a taxi to Manigango, to avoid staying the night in Serxu, which is 4200 meters above sea level. 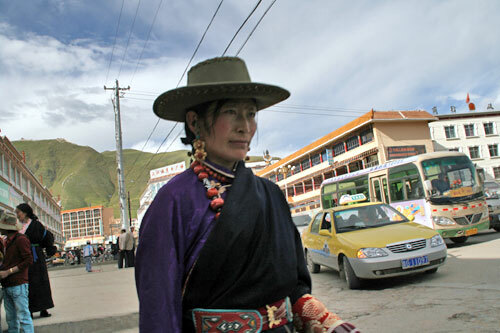 The taxi cost 1000 Yuan, including putting the driver up in the hotel in Manigango. The best part of this arrangement was that we were able to stop and see the enormous monastery at Serxu and visit the Dzogzhen Gompa and its amazing surrounding scenery along the way (see future article). From Yushu’s decrepit bus station you can venture out to a number of places including Zhiduo and Qumalai (where there is a big horse racing festival in early August which hadn’t been banned). Buses also go to Nangchen, Zaduo, and to Maduo for the Amnye Machen pilgrim circuit. Yushu to Manigango including Serxu and Dzogzhen Gompa. Wow, what fantastic pictures and what fantastic experiences. Thanks to you and Margie for enduring all those discomfort and braving the unknown to get these stories out to the world. Incredible!